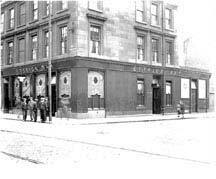 There’s been a pub on this site since the 1820s, it was originally called the Gun, when Hugh Aitken took over the premises he renamed it The Criterion, the original pub was demolished and a new tenement and pub on the ground floor was erected on the site. From 1961 till the 1970s James Campbell Corrance was landlord here, he also owned the Possil Bar, Possil Road. The Ettrick Bar, 519 Dumbarton Road, after reconstruction in 1956. Henry S Lymburn had the premises reconstructed as part of Glasgow’s growing number of Brighter Bars in the city. The reconstruction consisted of both interior and exterior. The use of Italian marble gave the frontage a brand new look. The interior had a main bar and a new cocktail bar, the main bar had a mural depicting shipping scenes. The manager of the pub was Mr T Blue.